Hosting a marketing event is an excellent way to interact with customers, expand your audience, build brand awareness and increase sales. According to the Event Marketing 2018: Benchmarks and Trends report, most marketers believe that events are the single most effective marketing channel compared to digital advertising, email marketing, and content marketing. Now, your company has pulled off the perfect marketing event. The venue was perfect, the speakers were engaging, the exhibits were just what was called for. And, the attendee traffic indicated a high level of interest. Yet, Monday morning, back at the office, the real work starts: following- up after the event. In order to maximize the impact of your event, you need to have a strategy to follow-up with attendees, stakeholders and prospects after the event. Here are some post-event strategies you can follow to help you convert prospects into buyers and leave a positive and lasting impression on your event and business. Planning an event and hosting it is time-consuming and demanding. If you don’t plan your follow-up strategy beforehand, chances are there will be at best, very poor follow-up and at worst, very little or no follow-up. Scheduling who will do what to reach out to prospects after the event will ensure that the job gets done. Assign tasks to specific staff members. This may sound obvious, and it is, but you might be shocked to learn that according to the Event Marketing 2018: Benchmarks and Trends report, a staggering 80% of trade show exhibitors don’t follow up with their show leads. (Tweet this!) Can you imagine the vast amount of money left on the table? In preparation for your follow-up strategy, plan to complete a lead qualification form after speaking with prospects. This is vital information that you will capture to qualify leads and save lots of time when it comes to following up with prospects after the event. Start planning your follow-up emails before the event, including when they will be sent. Your follow-up email is an important aspect of your event strategy – it’s a crucial step in achieving the goals set out for the event, be it increasing sales, creating brand awareness or expanding your customer base. Make sure your post-event email stands out. Keep in mind that your prospect will most likely have several emails to respond to after being absent from the office. A subject line like “Follow-up” is going to get you nowhere. Be very clear and specific on why you’re following up. Consider that sending an email on the day after the event might not be the best timing, in some instances – an exhausted traveler from out-of-town might not be in the mood to look at emails first thing when they arrive back – consider giving it a day or two before you make your approach. During the event, make notes on visitors’ business cards so you can remember the conversation and refer to it in your email, giving your email a personal touch. Keep this first email simple: say who you are, where you met and most importantly, why you making contact is important to them. Keep it short and to the point. Social media can help you to connect with your prospects, share your message and help to leave a positive and lasting impression of your event. You have been sharing news about the event on your social media accounts. Don’t stop after the event. Continue sharing your message. Make a short video that shows how the event went. Have snippets of people talking about the event and how it benefited them. Make sure it contains your company message. Post this on your Facebook, LinkedIn, Twitter and Instagram accounts. Keep posting photos from the event. Tag your speakers, industry leaders, and important stakeholders. Encourage your audience to keep tweeting and using your event hashtag to continue the digital buzz around your event. Stay active on Instagram. When you plan your Instagram schedule for your event, include the days and weeks after the event. This social media platform is ideal for promoting your event and engaging your audience in a fun and visual way. Use social media platforms to thank attendees, participants, speakers and industry representatives – these kinds of posts are popular and are usually shared immediately, extending the positive impact of your event. One of the most effective ways to follow-up with prospects after an event is to have something to offer that adds value for them. Consider segmenting your prospects into different categories with different offers for each segment. Following up with a tangible asset like an industry-relevant report, ebook, whitepaper or the like will enhance the business value for prospects and establish your company as a thought leader in the industry. Didn’t have the time or the resources to send out a survey and create an industry report? What about an intangible gesture? The value you add could be as simple as a referral to a business partner in your network that you know would benefit your prospect. Never lose sight of the fact that a marketing event is a relationship building tool. Following up with prospects after the event is a crucial part of that strategy. How you will measure ROI (return on investment) is determined when you decide what the goals are for your event. In fact, without having a way to determine event success, the whole exercise would be pointless. Be clear about what your primary goal is for the event. Do you want to build brand awareness, launch a new product, increase customers or generate qualified leads? The next step is to set some specific metrics for each goal. For instance, if your primary goal was to build awareness, you could set a goal of 5,000 attendees and 1,000 social media mentions. If your goal was to attract more customers, you need to establish how many of the qualified leads actually culminated in closed deals. If your goal was to build stronger relationships with your stakeholders, you could leverage surveys to determine attendee satisfaction and event involvement, taking into account the buzz that was created on social media. These factors should disclose whether you succeeded in your goal. These five strategies form the framework for the proper conclusion to your marketing event. Following them also guarantees that you can measure whether the event achieved its goal. Planning and executing your post-event strategy is as important as planning and executing the event itself. If you fail to implement a follow-up strategy, your event may essentially be a waste of valuable time, effort, money and other resources. 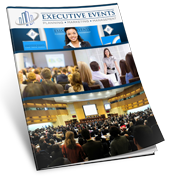 Executive Events is ready to help you plan the perfect follow-up strategy. Contact us today to chat about how to get the most out of events for your business.